The Tipografia Popular A. Palaio, Lda. was set up in Seixal by Augusto Palaio (a typographer previously established in Figueira da Foz), in 1955. The old typography is now the most recent extension of the Municipal Ecomuseum, that show in the original place the ancient techniques and knowledge of a traditional letterpress workshop, reusing machines that today are virtually excluded from the printing industry, but that have acquired historic value here. Built in 1403 by order of the High Constable Nuno Álvares Pereira, was administered until 1834 by the Santa Maria do Carmo Convent of Lisbon. It was then incorporated into the Public Treasury, following the extinction of male Religious Orders, having been sold at public auction to João Luís Lourenço, a prominent figure in the municipality of Almada, and as remained in his family until 1958. Up to this date, the mill was explored by several individuals, including the Gomes family, who took a strong role in the development of industrial milling in the municipalities of Almada and Seixal, keeping it working until 1980 decade, using tidal energy to grind the grain. Opened to the public in 1986 as part of Seixal Municipal Ecomuseum and is classified as a Building of Public Interest. 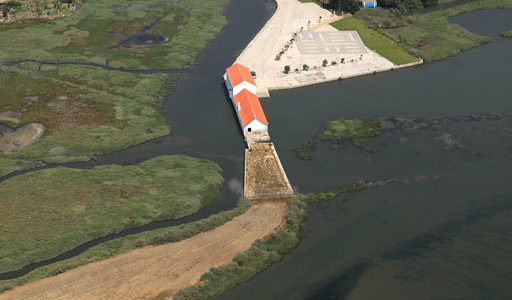 Is inserted in a protected natural area, the Corroios marshland and is one of the 45 tide mills identified in the Tagus estuary, being one of the oldest. It’s open to the public in this space, a long-term exhibition entitled "600 years of Grinding in Corroios Tide Mill". The company L. Mundet & Sons was established in Seixal in 1905, which would become the largest cork business company in the South Bank of the Tagus, of the country and even, for some time, of the world. This factory, beyond its importance in industrial and commercial terms, played an innovative role with its social policy (existence of nursery school, kindergarten and school, Sports Club, Welfare Centre, etc.). From the early 1960’s, some signs of economic and financial crises and recession in the company are aggravated, which already came from the previous decade, due, among other factors, the successive crises in the cork industry. Then, Mundet entered a slow process of decay, showed by the decrease in the number of employees – from 3,000 in 1947 turned to 645 in 1982. In 1989, after a long period of social struggles and several attempts concerning the factory economic viability, it’s definitely closed. In 1996 was acquired by Seixal Municipality. Nowadays, the Mundet factory site is a place loaded with history and vivid memories for some generations of Seixal inhabitants. The Caldeiras Babcock & Wilcox and Caldeiras de Cozer buildings were transformed into a museum unit and have long-term exhibitions about Seixal Municipality industrial heritage. In 1898, was settled in Vale de Milhaços the Gunpowder African Company, whose main goal was to manufacture black gunpowder to export to Angola. In 1922 was acquired by Mr. Francisco Camello, whose descendants still owned the property, changing its name to “Gunpowder African Society". 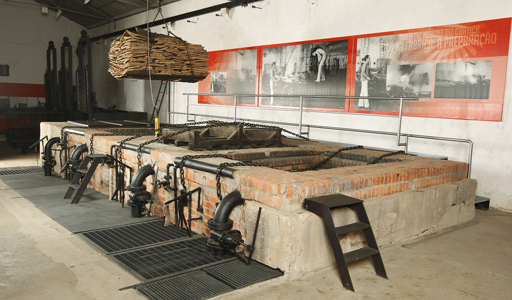 This industrial set, comprising the Black Gunpowder Circuit, preserves unique industrial characteristics dating back from the 19th century. Its most emblematic element is the Joseph Farcot steam engine, of 1900, with 125 horsepower, fueled by a João Peres wood-fired boiler from 1911. They’re working constitutes a true return to the time of the Industrial Revolution. 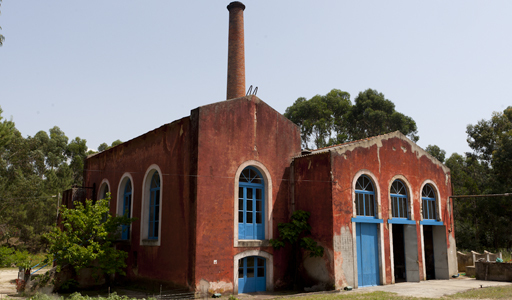 The Gunpowder Factory of Vale de Milhaços is classified as a Building of Public Interest and is an extension of Seixal Municipal Ecomuseum, aiming at its preservation and turning into a museum. Visits are subject to prior booking. The Quinta do Rouxinol Roman Pottery, a Seixal Municipal Ecomuseu unit, is located in the surroundings of Corroios Tide Mill, aiming the preservation and making into a museum of this archaeological site, classified as a National Monument, the only existing on Seixal municipality territory. The Roman Pottery is composed by 2 kilns for the production of amphorae and domestic pottery, having worked between the 2nd and 5th centuries and played an active role in local supply to Olisipo (Lisbon) and the several fish preserving centers of the region. These archeological findings are one of the most important collections of Roman pottery of our country.